Sarah and I very much enjoyed being at the Hearth before Christmas,among such friendly and hospitable people. 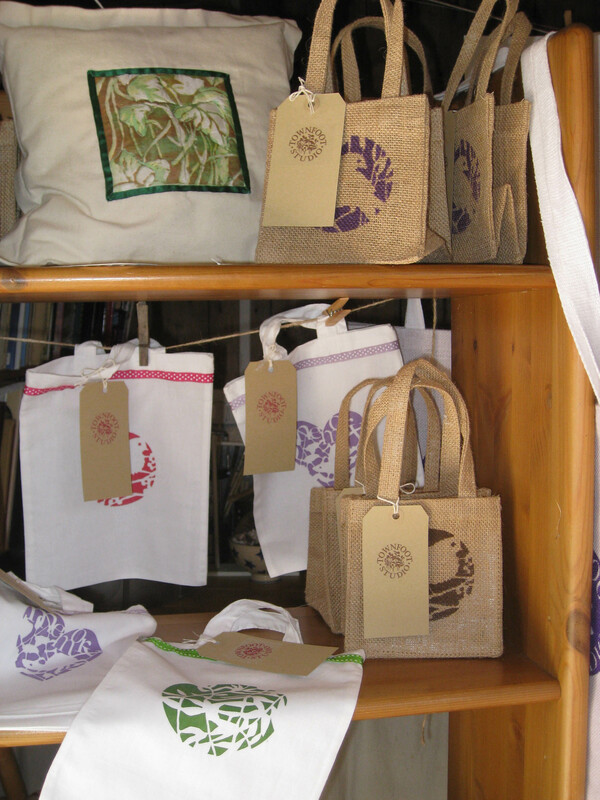 We sold some of our joint craftwork pieces and also made contact with the owners of an art shop at Corbridge who came to see us the following week for some printed bags, aprons and T towels to sell at their shop. 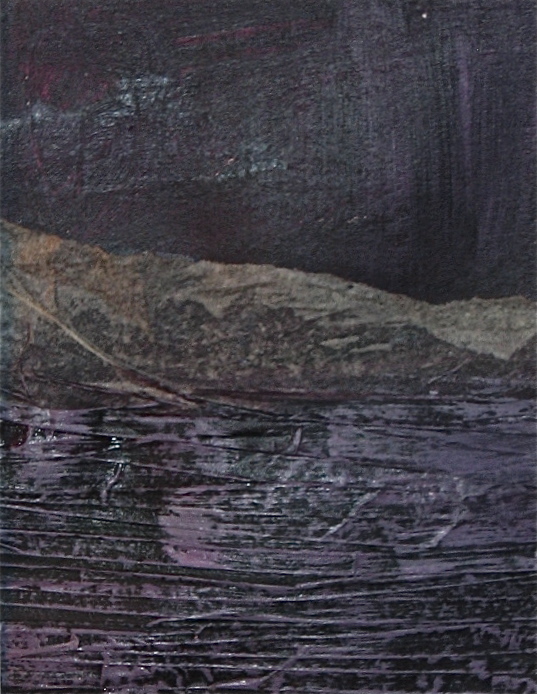 I’ve still got quite a way to go with this purple patchwork painting. 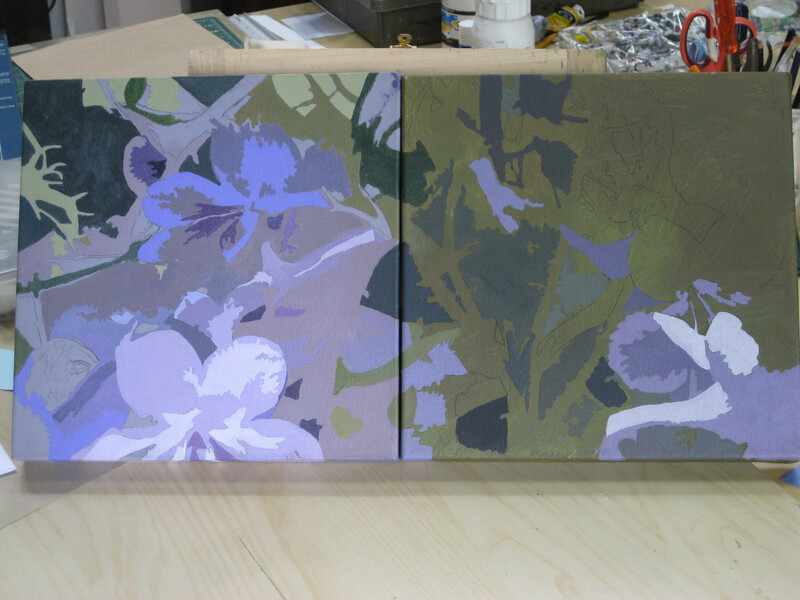 I’ve been working instead on the beginnings of a set of smaller canvasses, also based on greenhouse plants, in similar colours. I want to stay with the same greenhouse plants theme, but I need to start to include other groups of colour as well as purples such as yellows and oranges I think. The small canvasses are all 5 inches square at the moment, though I plan to vary the scale and shape a little and include rectangles and some slightly larger squares. They don’t have the overlapping shapes that the larger group paintings have and may look better displayed with spaces between them. I’m still working on the set of four paintings and some small canvasses, also about plants, but most of my work in the studio at the moment has been screen printing and sewing for the Christmas Fair at the Hearth on Saturday and Sunday. The bird cushions are not quite finished yet. I’ve printed the fronts and cut out the fabrics for the backs. After some shopping for buttons tomorrow, they’ll be done on Friday.All the other studio craft things are complete. 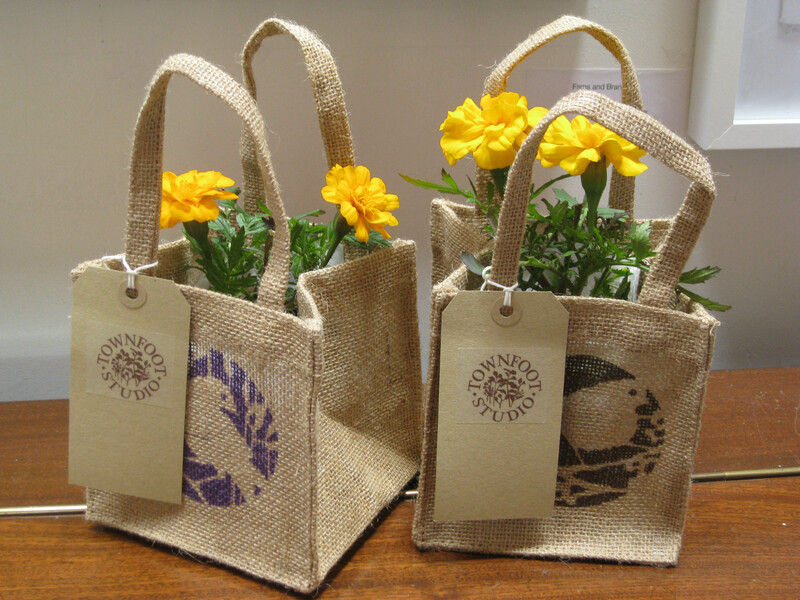 There are bags of different sizes as well as T towels, aprons and pin cushions. Sarah will be there too with her baubles, cut work and cards. The first canvas is almost complete and I’m well on with the second. It’s helpful to work on more than one at once so that the colours and shapes along the edges match up. 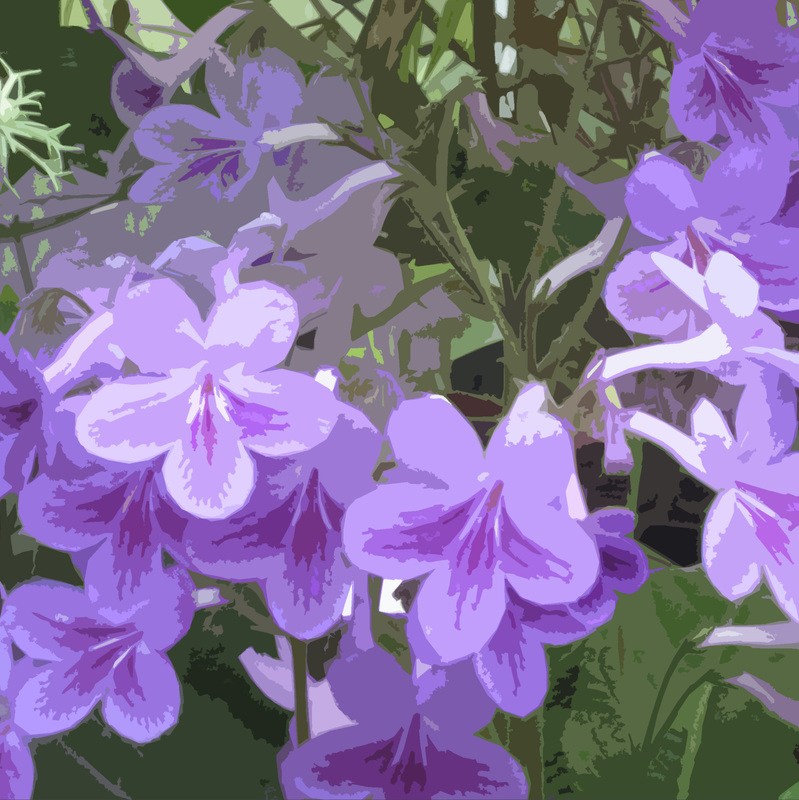 The simplified shapes of the leaves and petals often suggest other things to me. In this painting it is often butterflies and birds. 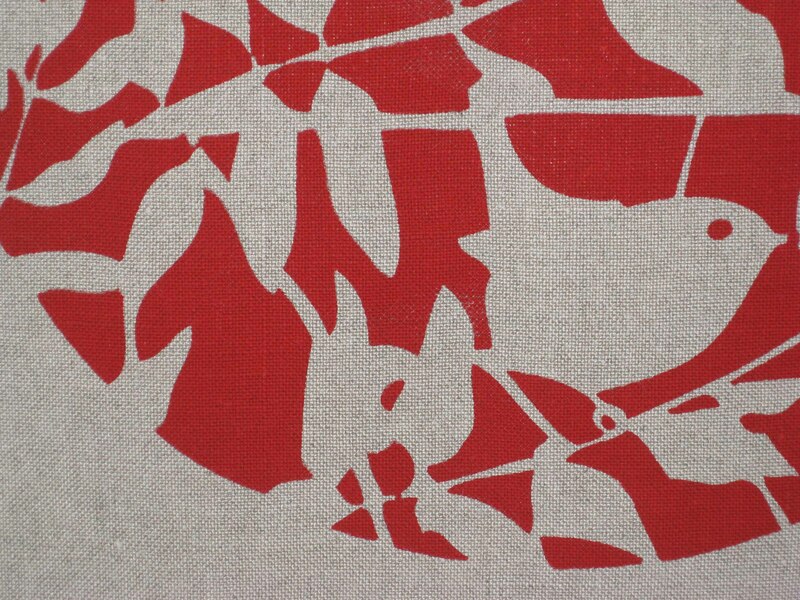 In the other group of four canvasses, the Spring Plant Patchwork, there were quite a few hearts here and there. When I need a rest from painting I’m busy varnishing the screens that we are using for the Townfoot Studio textile work. 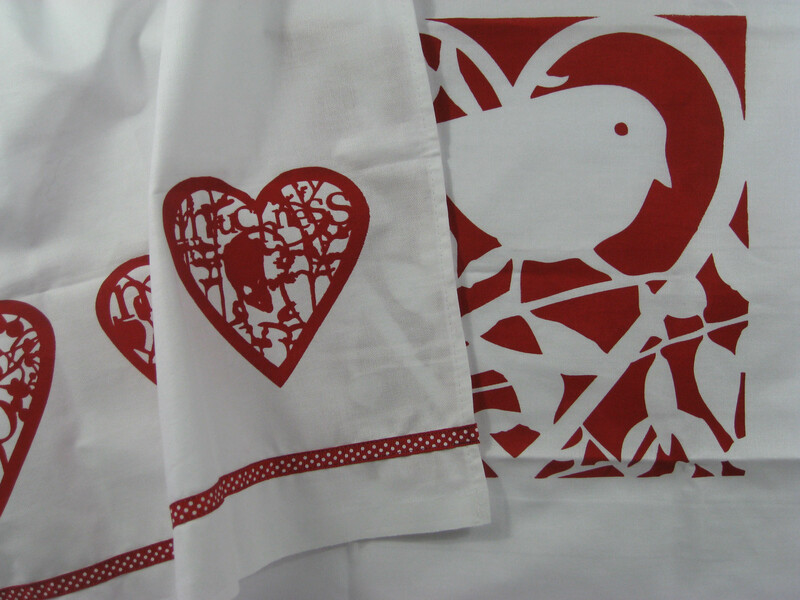 We’ll be selling them at the Hearth in Horsley when they have their Christmas Art fair early in December, so I’ll be busy printing and sewing for that. 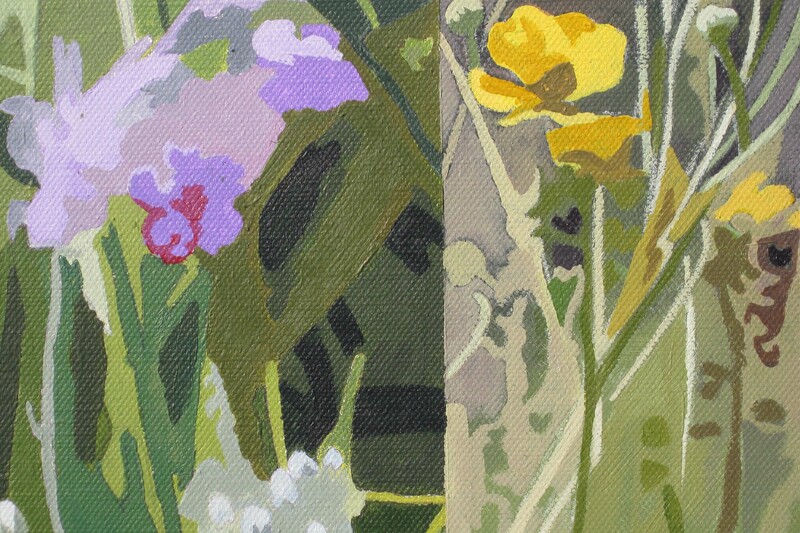 Selling my ‘Spring Plant Patchwork’ at our Open Studio in June has encouraged me to continue painting in that way. I’m really excited about my new images based on some greenhouse plants I photographed at Wallington last month. I am happy with the balance of dark and light tones, giving a strong impression of depth, and I love the grey/lilac colours. The colours and tones are showing really well on photographic paper, and are much better to work from than prints on matt paper, even though they are not the same size as the paintings. The outline of the images is printed at the same size as the canvas. 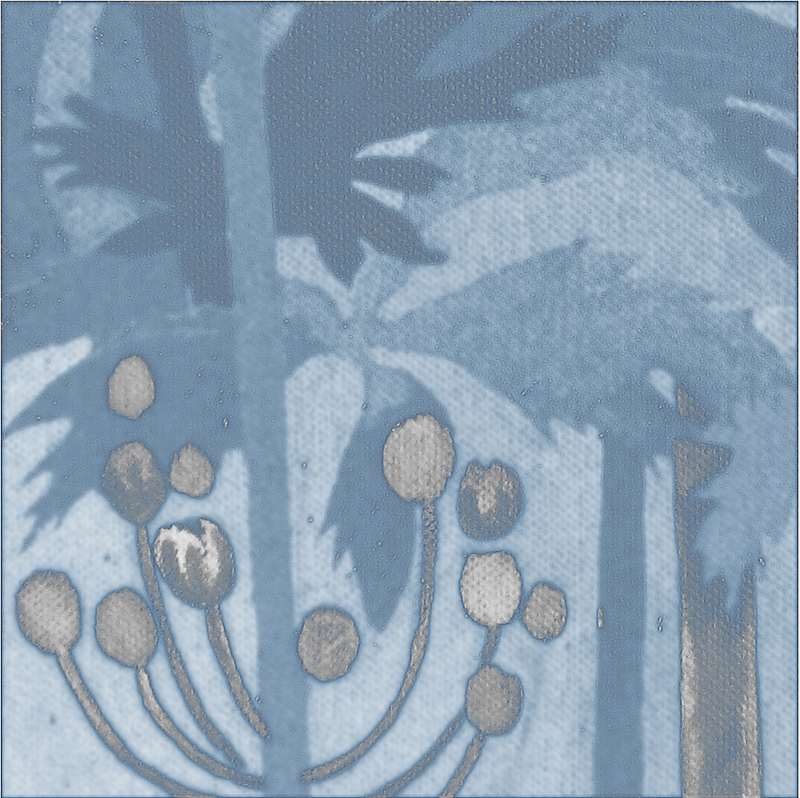 This time I’m only using an A4 printer, so I’m having to divide each 12″ square into two halves at the outline stage. I’m still painting a base colour before using old fashioned carbon paper to transfer the main outlines to the canvas. 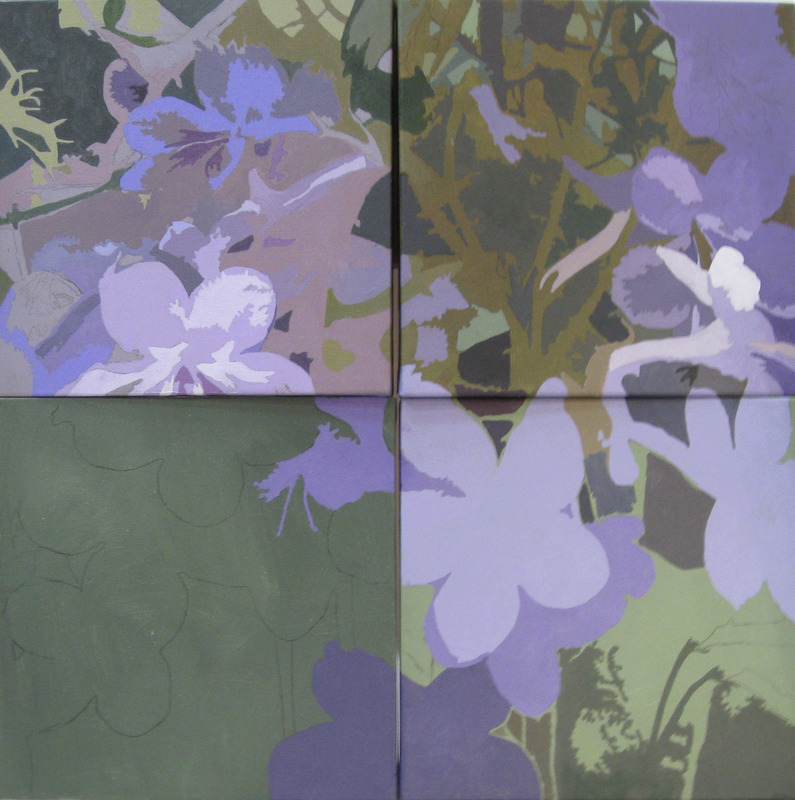 I started the painting last week, and I’ve nearly completed all the flower sections of this square which will be the top left quadrant. I’ll start the grey/green background soon, and also prepare the next outlines. We’ve enjoyed changing my studio to an exhibition space again, and displaying our work together. 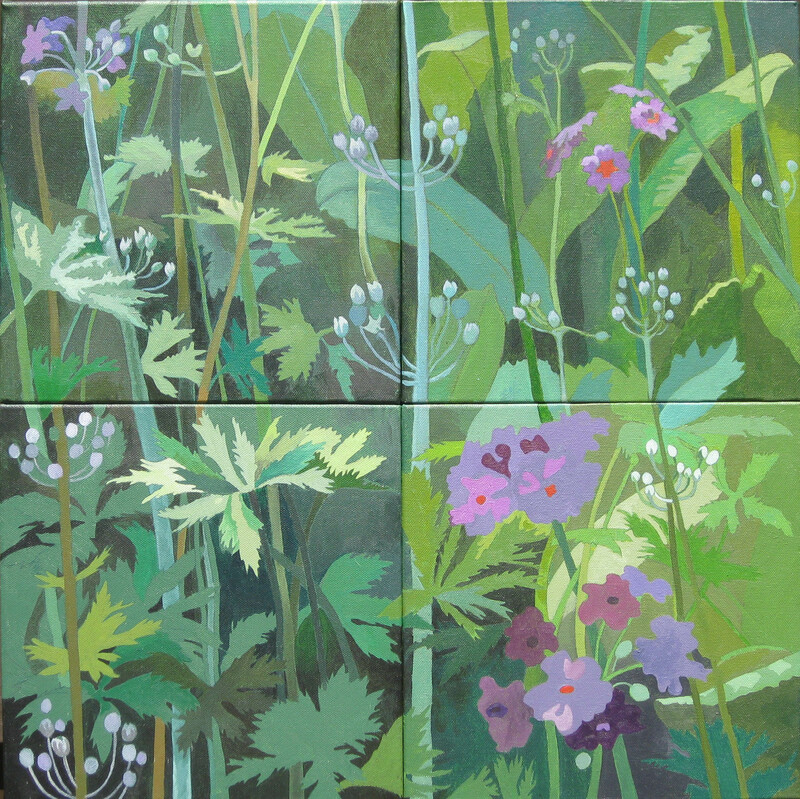 We’ve had a steady stream of visitors, some new and some old friends from last year.I managed to finish my Spring Plants painting on 4 canvasses, had them fixed together with screws. About two weeks ago Sarah and I decided to do some screen printing of her designs. I have been wanting to do this as soon as she started making her cutouts, so I am really happy to be involved. 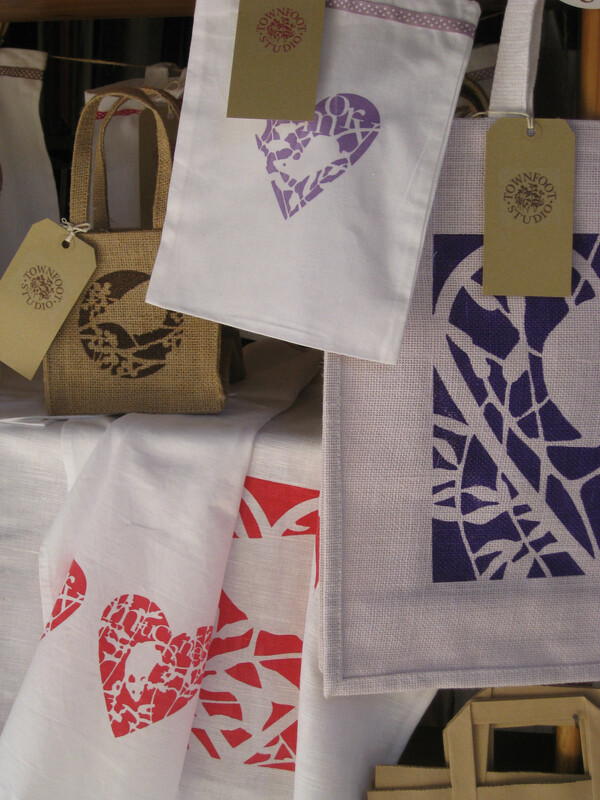 We’ve only produced a few bags and tea towels so far, but tapestry kits and cushions will be next, and we’re planning to be at one or two craft fairs before Christmas. I’m hoping that we’ll have a table at the Alnwick Craft Fair which is held in the Northumberland Hall in October. I made several attempts at machine stitching onto the dissolvable film, practising first on paper, but wasn’t happy with the results. It might have been more successful if the thread had been a lighter tone. 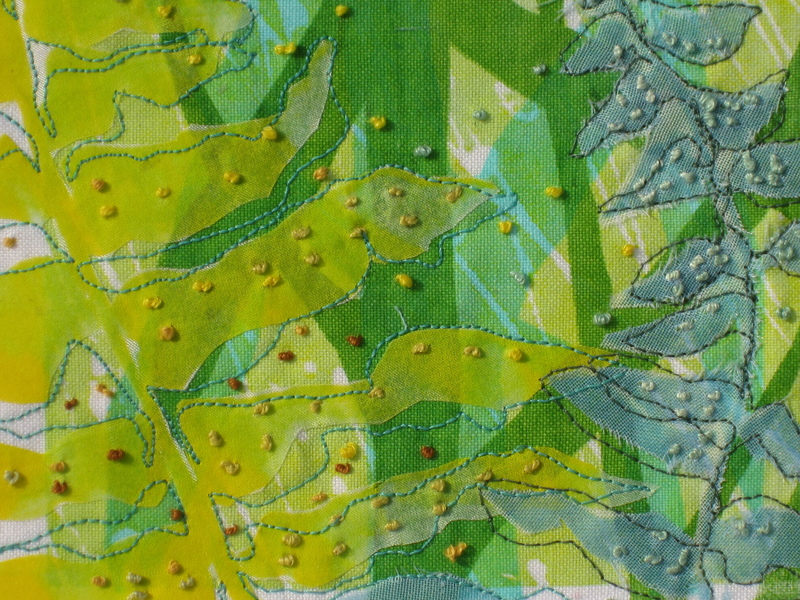 I had much more fun with the free machine embroidery, using the fern leaf shape as inspiration rather than trying to outline the shapes exactly. I’ve finished four small panels now and framed them in box frames. 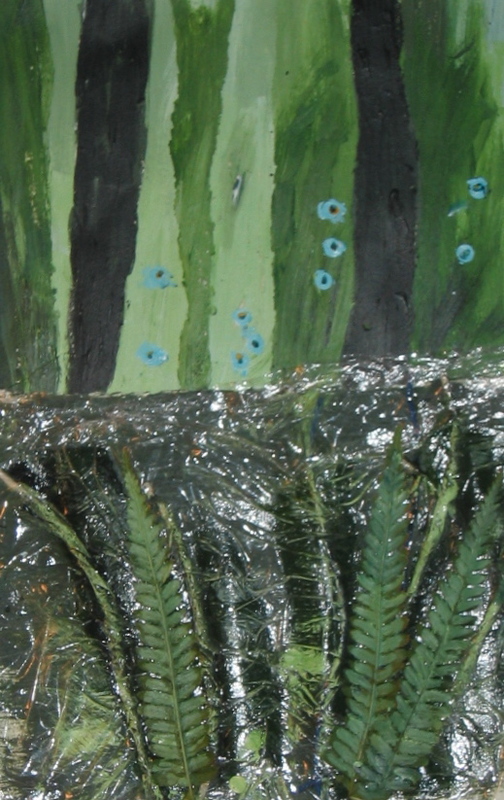 I’ve finished the plant tryptich (still using the painting method I started for the community art project) and I’ve just started a new, smaller painting based on the bluebells which are starting to bloom on the garden path. 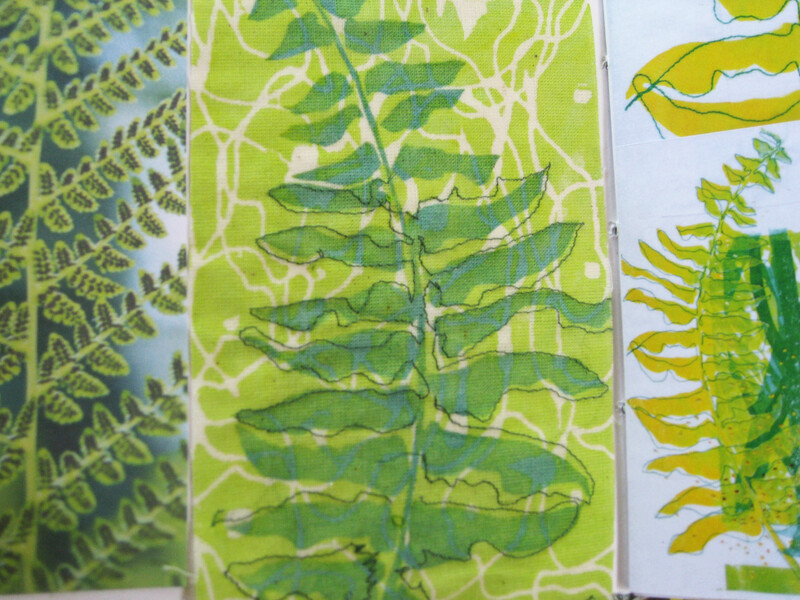 Some of the sections of the tryptich have been printed as postcards ready for the Open Studio event in June. At the same time I’ve been doing some screen printing as a background to machine and hand embroidery, also based on plant forms. I want to try some with added stitch onto dissolvable plastic. 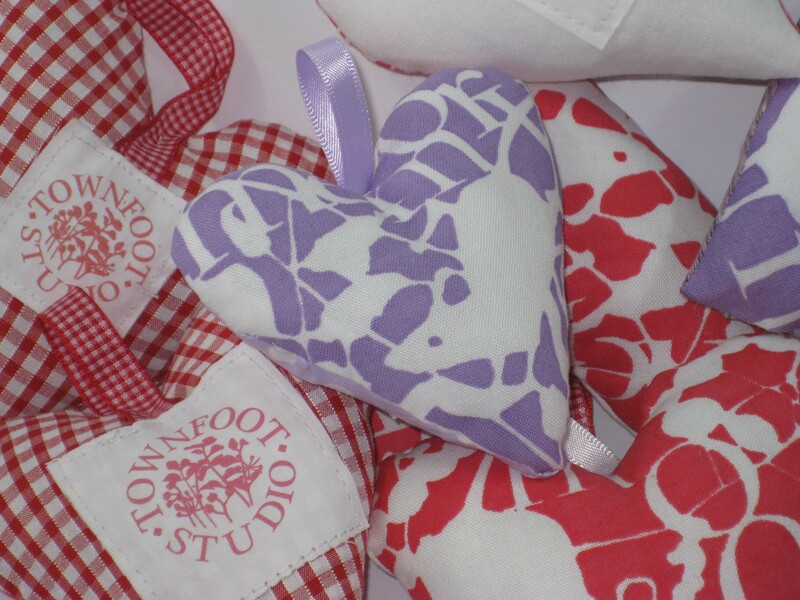 Sarah and I will both be showing our art work in our studio at Townfoot at the Network Artists Open Studios event in June and July this year. 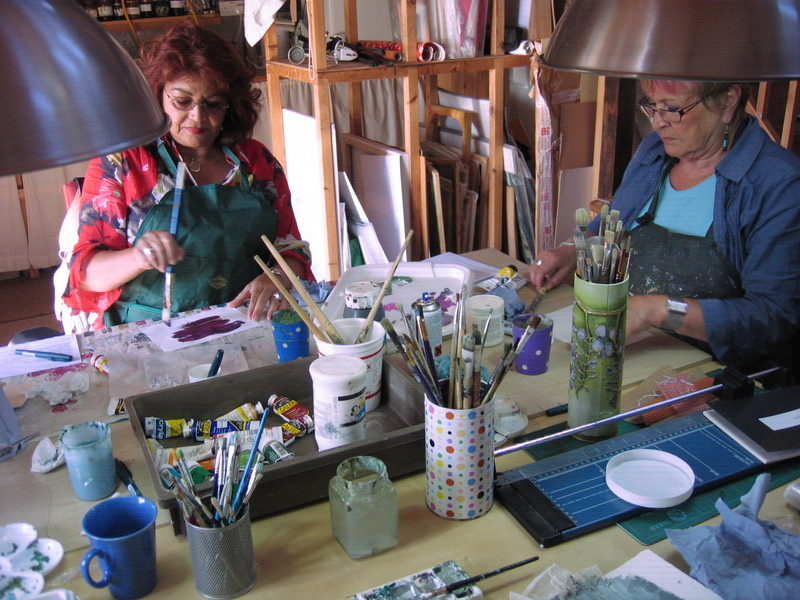 The studio can be visited from 10am – 4 pm on Saturdays and Sundays in the last two weekend in June, and the first weekend in July. We are also offering a workshop course each – full details on our websites. I’m busy painting at the moment. 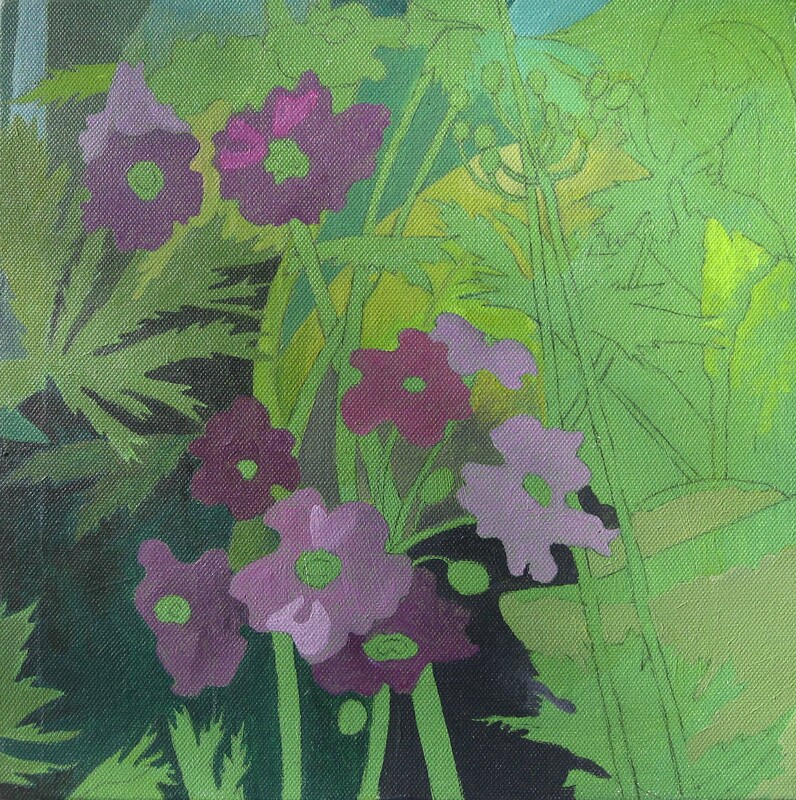 I still have a little more to finish on the last primula square canvas from the Spring set of paintings. 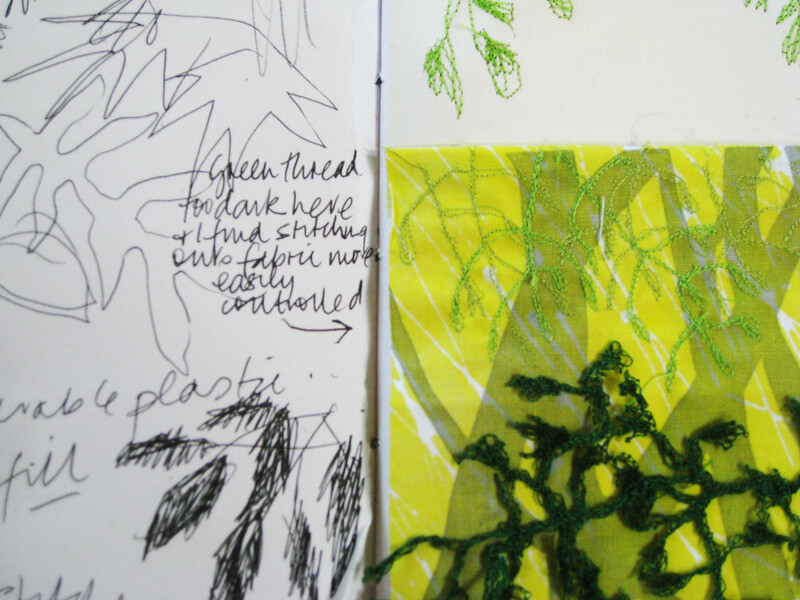 I’ve also been doing some plant based screen prints which I plan to overlap in layers and work into with threads. 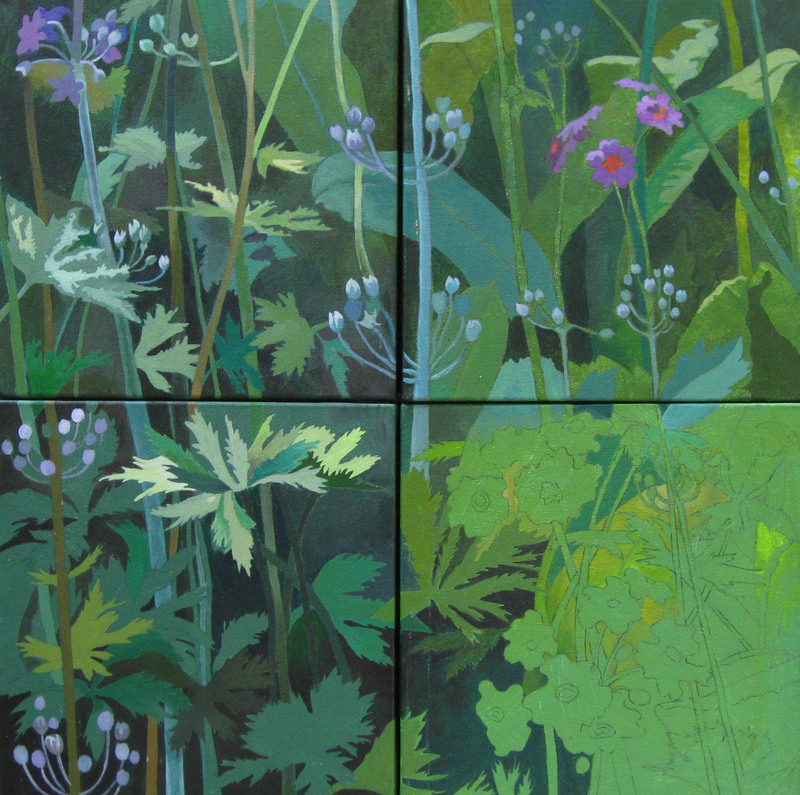 On the same theme of Spring Plants, I’ve begun another acrylic painting on canvas, again divided into sections, but on one canvas this time. The section on the left is based on primulas again, mainly for their larger leaf shapes, and also the opportunity to use purples and lilacs. 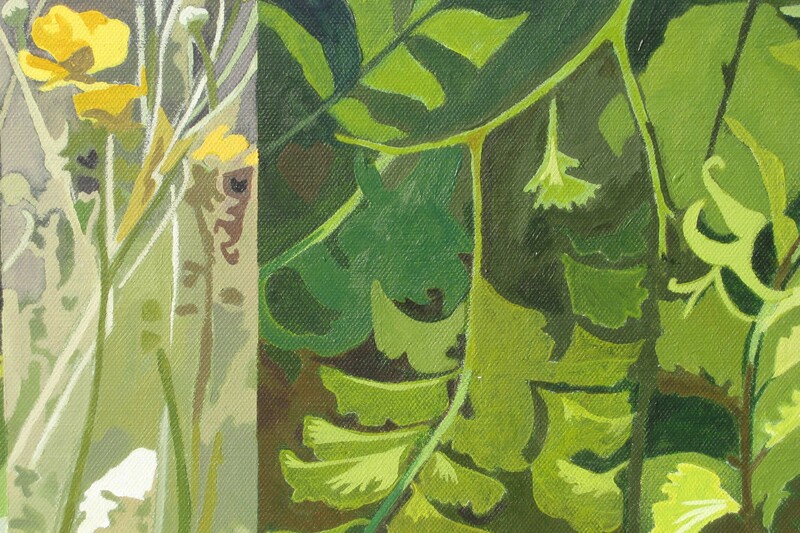 The narrow middle piece is grasses and buttercups and the right hand foliage is based on enlarged fern leaves. I’m still using the same methods I developed in the Elsdon community painting. 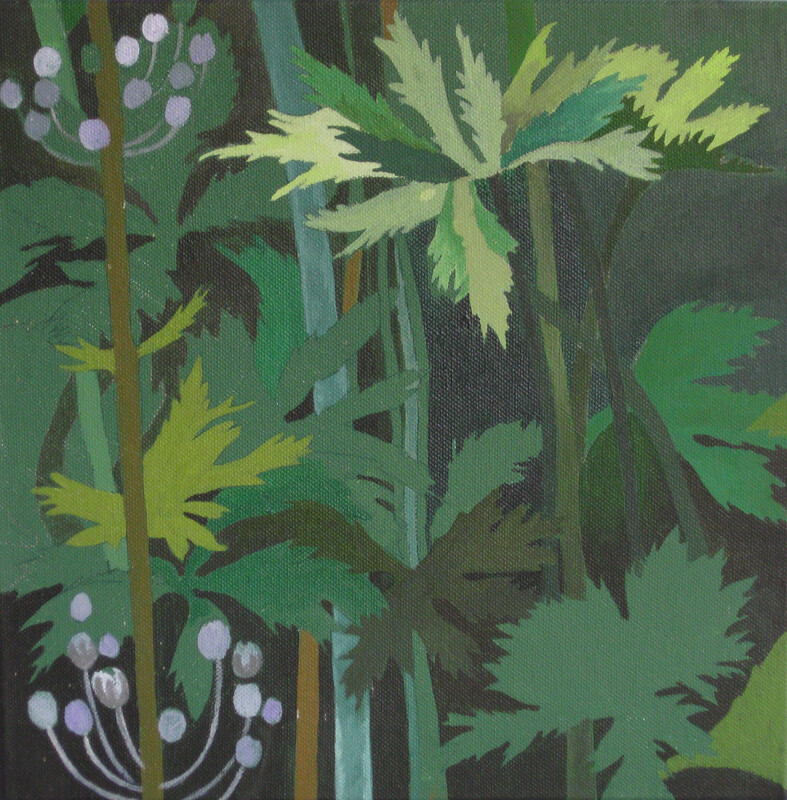 I like the slightly abstract approach to the shapes of the plants, and the pattern quality it seems to emphasise. I like the way some of the angles of the stems are echoed in the different sections, but I think I want to make the overall tone of the centre piece paler so that it comes forward more. 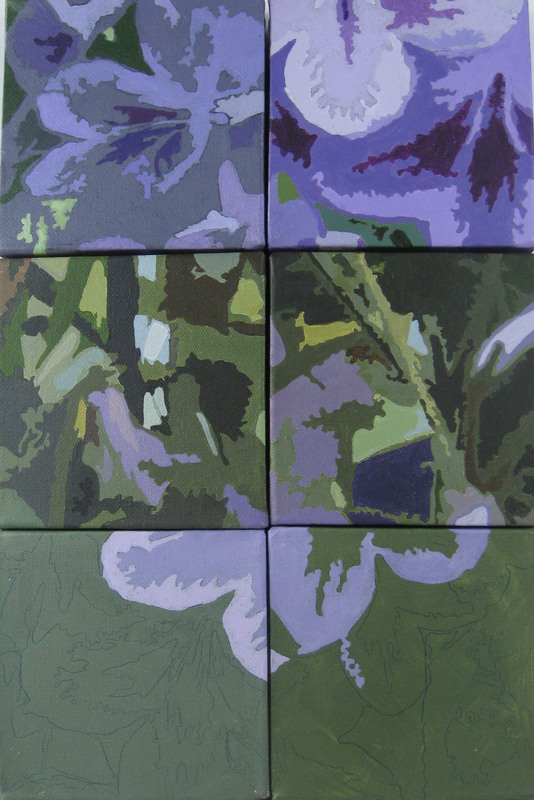 I still haven’t completely finished all four sections of the ‘Spring Painting’ I started in June, but I managed to complete one more of the four canvasses leaving only one still to do. 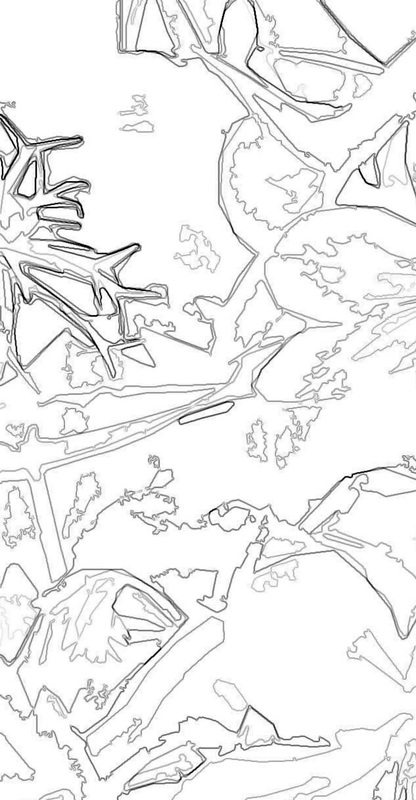 I usually use some part of the art work I’m working on for my Christmas cards. I wasn’t sure if the Spring paintings would work at first, but some experimenting with filters on Photoshop helped to make the image more wintry. I’ll add some machine stitching in silver and a few silver sequins or stars. I really enjoyed giving the painting workshop at the beginning of September. Thank you to Sylvia and friends for joining in with such enthusiasm and for producing some lovely work. 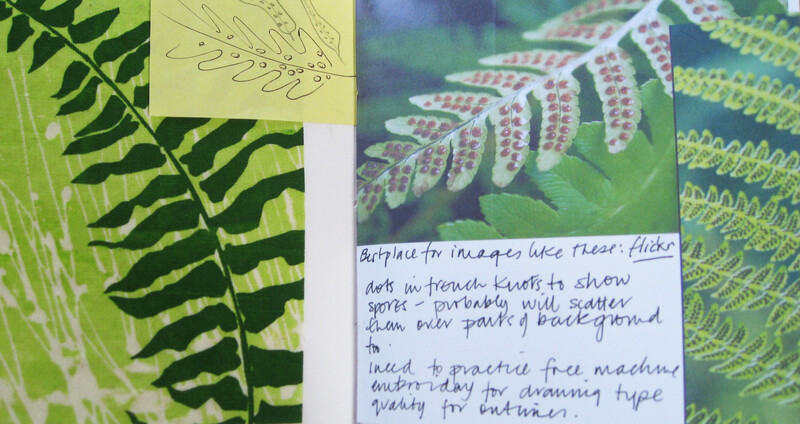 Everyone managed to produce a good variety of mixed media samples for their sketchbooks, with notes on how they made them. 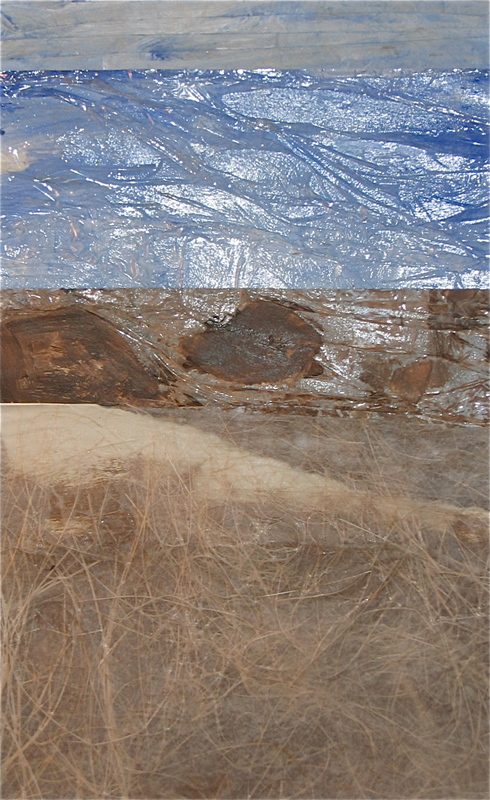 After lunch we all moved on to interpreting sections of landscape photographs with the methods that seemed most relevant to the textures and shapes we could see in them.